Sorry! This one is GONE!! 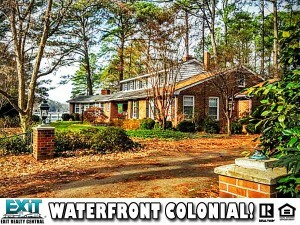 Huge colonial style on river. Rare opportunity! Custom brick, formal LR & DR looking over lg gardens. River views. Lots of attn to detail; custom mill work, wide crown & dentil moldings & 2 custom fps. 4th bdrm suitable for nursery/office. No flood ins. Similar homes selling for over $500k. Lakewood, 23509, Colonial, Attic Fan, Cable TV Hookup, Gar Door Opener, Intercom, Security Sys, 220 V Elec, Dishwasher, Dryer, Elec Range, Refrigerator, Washer, Bar, Scuttle Access, Walk-In Attic, Walk-In Closet, Cul-De-Sac, Inground Sprinkler, Irrigation Control, Patio, Bulkhead, Creek, Navigable, River, Tidal, Breakfast Area, First Floor Master Bedroom, Foyer, Pantry, Porch, Utility Room, 4 Car, Attached, Close to Mass Transit, Driveway Spc, Garage, Multi Car, Fixer Upper, Basebd, Natl Gas, Zoned, Central Air, Willard Model Elementary, Lafayette-Winona Middle, Maury High School! See Other Lakewood Houses for Sale!